If you are even a casual baseball fan, odds are that you have been angry at Joe West at least once in your life. It is more likely, however, that you have been ticked off at the 59-year-old umpire many, many times. The most sterling example of Joe West’s ineptitude came in 1991, when after an argument which resulted in a fine, Chicago Cubs outfielder Andre Dawson wrote on his check to the Major League offices that it was a “donation for the blind.” It is amazing what your thumb can flip to, but in this instance my vinyl-sorting finger took me to a record I had only heard about and never dreamed of ever seeing, nonetheless owning: Joe West’s Blue Cowboy. His contribution to music has not been limited to the time he once threw Tug and a young Tim McGraw out of a spring training game. 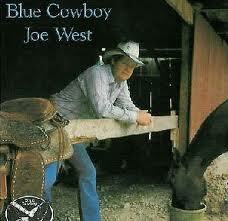 West has two country albums to his name: Blue Cowboy and Diamond Dreams. In this instance, my luck brought me to Blue Cowboy and I could not resist the temptation to fork over the $3.00. An 11-song record which naturally includes “Take Me Out To The Ballgame,” Blue Cowboy easily ranks with Ron Artest and Carl Lewis as one of the worst albums that a sports figure has cut… ever. I can say that I managed to make it through the record, although it was not easy. Cowboy Joe’s LP consists of eight covers and three original tracks that are flat-out bad. West’s singing voice is to melody as his eyesight is to clairvoyance. The promotional bit on the back of the record hails Blue Cowboy as “a hit,” but it is only a swing and a miss. The unfortunate aspect of listening to Joe West sing is that I can’t tell him to keep his day job; he is not good at that, either.